After three consecutive years of very long, very contentious, and very difficult WSFS Business Meetings, we appear to be returning to relatively normal conditions. 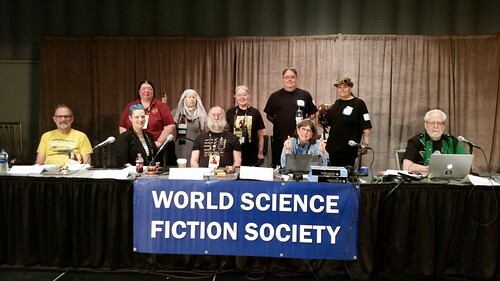 Today's WSFS Business Meeting dealt with nearly everything on the agenda, and it looks pretty good for us to complete the remainder well before the Worldcon Chairs' Photo Session tomorrow afternoon at 12:30. Here's a photo of everyone on the WSFS Business Meeting team, both officers (seated) and staff (standing). The back row, standing: Sargent-at-Arms Terry Neill, Assistant Sargents-at-Arms Anne Davenport and Janice Mars, Assistant Videographer Scott Sanford and Videographer Lisa Hayes (holding Kuma Bear). In the front row, Seated (L-R): Timekeeper Paul Dormer, Deputy Chair Jesi Pershing, Chair Tim Illingworth, Secretary Linda Deneroff, Parliamentarian Donald Eastlake III. It looks like a lot of people looked at what got tossed off the agenda at the Preliminary Meeting yesterday and decided it wasn't worth hiking down to the west end of the Convention Center, even with coffee and tea (provided by a generous sponsorship grant from Google; convention center coffee/tea costs more than $100/gallon). Once the meeting convened, we fairly flew through the agenda. I could barely keep up with things and still participate myself. Remember to refer to the 2018 WSFS Business Meeting Agenda for details of proposals. First up was an extra piece of business allowed onto the agenda by the Chair, per the rules. A.3. Update to Deadlines for Submission of Reports: Sets the submission deadline for reports to the Business Meeting to be the same as what was adopted yesterday for submitting new business and amendments to constitutional amendments awaiting ratification: 30 days. These are constitutional amendments first passed at last year's meeting. If ratified here, they take effect at the end of the current Worldcon. C.1. What Our Marks Really Are: Removes the fixed text listing the WSFS service marks with an instruction that the WSFS Mark Protection Committee will specify the text to be used by Worldcons. Ratified without debate. C.2. The Reasonable Amendment: Changes "best efforts" to "reasonable efforts" in a section of the constitution dealing with contacting finalists in a certain situation. "Best effort" is a legal phrase and can be quite expensive compared to "reasonable effort." Ratified without debate. C.3. Make Room! Make Room! Removes the "lesser of 5000 words" language from the gray zone between written-fiction Hugo Award categories, leaving only the 20% leeway. Net effect is to create a larger gray zone on the Novella-Novel boundary. Ratified without debate. C.4. Name That Award: This names the newly-created WSFS Award for Best Young Adult Book ratified last year and being first presented on Sunday night of Worldcon 76 the "Lodestar" Award. This was ratified after debate, but in the process led to an historic event in WSFS. Tim Illingworth recused himself from the Chair because he'd been on the committee that proposed it. That put the deputy, Jesi Lipp in the chair, and they presided over the debate and vote that ratified "Lodestar" and the name for the YA Award. That means that Jesi becomes the first woman to preside over the WSFS Business Meeting since Anne Moffat took over at the 1958 Worldcon that she chaired. 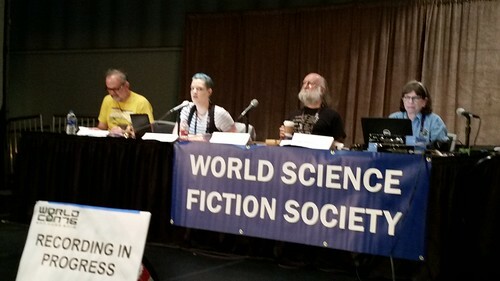 This was Jesi's first time in the top spot, but not the last: Dublin 2019, An Irish Worldcon has appointed Jesi to preside over the 2019 WSFS Business Meeting. So "Lodestar" is the official name of the new YA Award, effective in 2019. Someone wanted to try to make this retroactive and to apply to the award being presented this year. That's out of order for both legal and practical reasons. The legal one is that while ratified changes become part of the Constitution the moment they are ratified, they don't take effect until the end of the Worldcon that ratifies them. This is part of the Constitution, not the Standing Rules, and cannot be suspended. The practical one is that the plaque for this year's award has already been engraved! New proposals to amend the WSFS Constitution, if passed here, will be sent on to the 2019 Worldcon for ratification. D.1. Remote but Real: Removes the restriction on remote participation at the Business Meeting, but does not require Worldcons provide remote participation. Referred to a Committee to be chaired by Kate Secor, one of the proposal's co-sponsors, to reconsider the issues and potentially propose new language next year. D.2. Adding Series to the Series: A clean-up proposal from the Nitpicking & Flyspecking Committee that adds Best Series to the rule that discuses the medium of expression of what we typically call "written fiction" categories. Passed without debate, although there was a question about why the Secretary didn't just do it if it was so minor. The NP&FSC actually discussed this while we were considering it earlier this year and decided that while it's clearly an oversight in the process of adding Best Series, it's just barely substantive enough that it can't be fixed by Secretary's editorial fiat. D.3. Counting Comics. Changes the way in which graphic story works are counted. This proposal was Postponed Indefinitely at the Preliminary Meeting and was not considered. D.4. Best Podcast Hugo Award. Would have changed "Best Fancast" to "Best Podcast." Postponed Indefinitely at the Preliminary Meeting and was not considered. It seems likely that the Hugo Awards Study Committee (of which I'm a member) did not fully grasp the ramifications of the wording changes proposed. D.5. Professional and Fan Artist Hugo Awards. This proposal was previously postponed until not before 11 AM Sunday due to a scheduling conflict with the ASFA Business Meeting. D.6. Comic Books and Graphic Stories. Adds "or Comic" to the Best Graphic Story Hugo Award category title. Does not modify definition, which already included comic books as graphic stories. Passed after a brief debate. D.7. Notability Still Matters. This restores a previous rule that existed prior to the current "E Pluribus Hugo" nominating system that allowed Hugo Administrators to leave works off the "they also ran" (sometimes called "top 15 nominees") list if they had only a small percentage of the votes. This went off into the parliamentary weeds, but in the end was passed as amended, with the threshold set to 4% (not 5%). And thus at 11:13 AM, the Business Meeting adjourned having disposed of nearly everything there was on the agenda. We'll be back on Sunday at 10 AM for Site Selection business, including the announcement of the results of the 2019 NASFiC and 2020 Worldcon elections, followed by Question Time for the 2019 Worldcon and potentially for any 2020 NASFiC and 2021 Worldcon bidders. No earlier than 11 AM, we'll take up the Pro/Fan Artist Hugo proposal, and probably another late addition to the Standing Rules relating to which report the 30-day deadline applies. The meeting thus broke up almost 2 hours early, but I was there for much longer, along with Scott and Lisa. For some reason, the video "thumbnails" that come off the camera in short segments on an SD card were corrupted. Fortunately the same files are kept on the camera's P2 memory card and were intact. Unfortunately, their time-stamps somehow got scrambled, and it took Scott much of an hour to get them sorted out into the correct order. I later got those files uploaded and also corrected a file name error on the Friday files. The whole series is visible on the 2018 WSFS Business Meeting playlist on the Worldcon Events YouTube channel. I've been as time permits converting the much-higher-quality video files available from the camera to MP4 so I could upload them to YouTube. It took quite a while, even with good upload speeds available here, but the higher-quality recordings (only two per day instead of six or seven) are now online at the 2018 WSFS Business Meeting (Higher Quality) YouTube playlist. Dealing with the Business Meeting, even a short one like this, took up a whole lot more of my day than I expected. 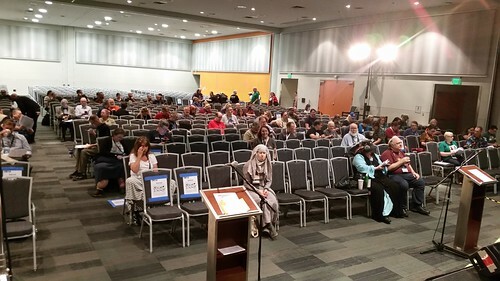 Fingers crossed that tomorrow won't be quite as hectic, although we'll have a game of musical chairs as we quickly reset the chairs (and then put them back afterwards) for the Worldcon Chairs' photo at 12:30 Sunday afternoon.